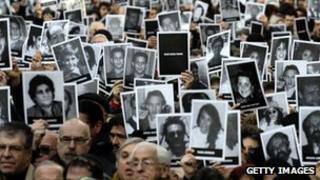 Israel has strongly criticised Argentina for its decision to work with Iran to investigate a 1994 bombing of a Jewish cultural centre in Buenos Aires. The "truth commission" will be made up of five independent judges, none of whom will be from the two countries. But an Israeli spokesman said the move was tantamount to "inviting a murderer to investigate his own killings". The Argentine ambassador, Atilio Norberto Molteni, was also summoned by the Israeli foreign ministry. Argentine courts have blamed Iran for the bombing of the cultural centre run by the Israeli-Argentine Mutual Association (Amia), which killed 85 people. Tehran has always denied any involvement. If followed an attack on the Israeli embassy in Buenos Aires two years earlier. Argentine prosecutors say the Amia attack was planned and financed by Iran, and carried out by the Lebanese Shia Islamist movement, Hezbollah. In 2006, they sought the extradition of eight Iranians believed to have been involved, including Iran's current Defence Minister, Gen Ahmed Vahidi. On Monday, Argentine President Cristina Fernandez de Kirchner called the agreement to set up a judicial commission "historic", saying it guaranteed "the right to due process of law, a fundamental principle of international criminal law". However, the BBC's Wyre Davies in Jerusalem says that decision has both exasperated and angered the Israeli government and some Jewish groups in Argentina. He says the Argentine ambassador in Tel Aviv was summoned on Tuesday for what was described as a "clarification talk". Israeli officials said the commission would hinder rather than help the search for the culprits. Correction 6 March 2013: Making clear it is some rather than all Jewish groups which criticised the proposed commission.